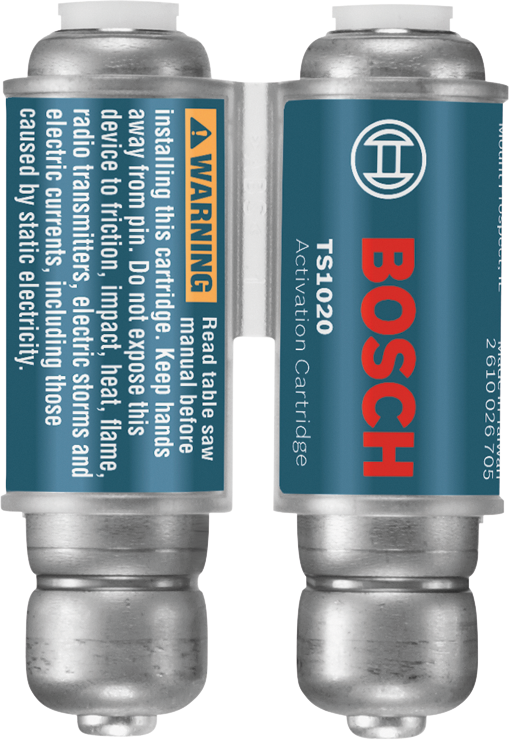 The Bosch TS1020 Dual-Activation Cartridge is exclusively designed for use with the Bosch GTS1041A REAXX10 In. jobsite table saw. The dual-activation cartridge is part of the saw's Active Response Technology, which imparts a low-voltage electrical signal onto the blade. The signal alters upon contact with user's skin, triggering a chemical reaction in an activation cylinder similar to the deployment of an air bag in an automobile. In this case, instead of deploying an airbag, the chemical reaction fires a piston that pushes against the drop arm. This action rapidly forces the saw blade down and away from the operator, mitigating serious user injury. Each cartridge allows for two activations before replacement is needed. Additional onboard cartridge storage is also located onboard the tool. After activation, the system can be reset in less than 60 seconds. Each of the dual-activation cartridges has been designed to have a 20-year shelf-life, and each has an expiration date printed on it. The dual-activation cartridge works with standard 10 In. fine finish and construction-grade blades and stacked dado blades.